This study aims at demonstrating how cycle tourism could activate a regeneration of small and medium sized stations in inland areas, able to involve also territorial and urban areas hosting these stations. 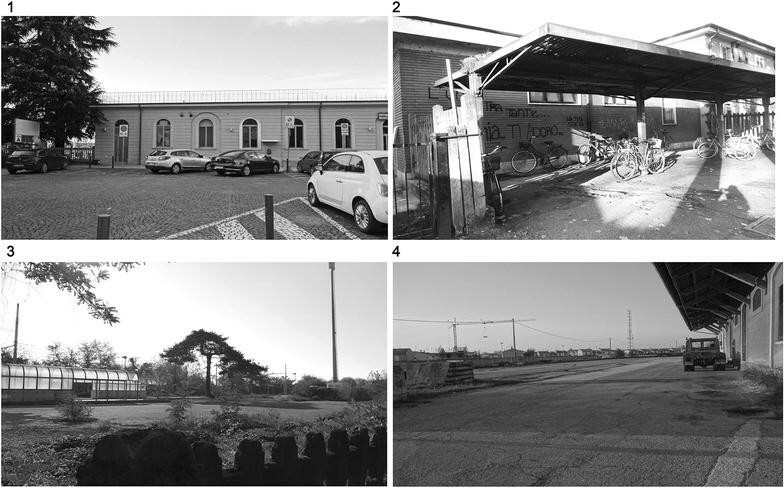 Starting point of this research is the issue of the small and medium sized Italian stations, mostly unused even if they are still active as rail service. Since control of trains’ traffic is organized only in bigger railway yards, small stations are gradually becoming empty containers: ghost stations, without any railway personnel. Thanks to the potentiality of the cycle tourism, riding slow through landscapes, it becomes possible to valorize and safeguard this heritage, not only exploiting its potentiality as shift-node between train and bike, but also imaging a systemic strategy triggering urban, territorial and social reactivation. Main challenge was to experiment how another model of mobility, the cycle tourism, able to promote a territorial project preferring to pass slowly through the inland areas, avoided by the fast infrastructural lines, could contribute in such regeneration process. In order to validate this intuition, it was carried out a project of four stations in proximity of the cycle tourist path VENTO, along the Po River. These stations were transformed in “green mobility hubs”, where shifting from train to bicycle and vice versa. This becomes the occasion to imagining new functions hosted in empty spaces of stations (both internal and external): they will provide cycle tourists with territorial info and specific services, such as repair areas and bikes and baggage safekeeping and both tourists and local inhabitants with social activities in order to bring them to live again station’s area. These functions want to generate an expectation, both in tourists and local people, to rediscover the territory around: in this way stations reassume their role of urban and territorial gates. In this work we focus on a new opportunity that can arise matching together cycle tourism and stations. From this perspective, designing a strategy for possible reuses of small and medium sized stations implies not only the increase of rail services with positive effects on the train transport policy, but also the occasion to regenerate urban spaces where stations are located and their surroundings. Indeed, railway station is not simply a transporting facility, but also a heritage with a regenerative possibility for urban space with enjoyment of the city scenery (Ye-Kyeong and Hye-Jin 2015). Even in contemporary city, stations act as a symbolic presence (Lee 2003) and railways can lead to economic growth and the revitalization of urban area, especially in rural and inland areas stations where they involve also a social and territorial dimension: “Do much to sustain small towns in the countryside by reinforcing the local economy and providing a magnet, albeit on a small scale, for future growth. Country stations are often the main social and business focal point of rural areas, locations where tourist services are promoted […] both a means of access to other places and a center for local enterprise and cooperation” (Edwards 1997). This heritage of small and medium sized stations is mostly located in inland Italian areas, distant from metropolitan areas of the Country. In these territories, where the accessibility is one of the main critical issue, rail mobility assumes a relevant value in determining the access to other services or places that are citizenship constituents, such as health and school and cultural facilities (UVAL 2014). Not only the provision of adequate transport service primarily constitutes a pre-requisite for the development of inland territories, but it can also provide momentum for local growth. Identifying innovative solutions, both managerial and related with a possible integration with other sustainable mobility, is a big challenge for local development policy. These preliminary considerations lead to the identification of some criteria to help shaping a mobility strategy for the inland areas. One of these consists of encouraging modal shift towards collective transport, improving and relaunching rail system. Promoting exchange of habits of travel from car to rail is seen as a key strategy also by the EU (Brons et al. 2009). Indeed, already in 2011, the European Commission announced its official transport policy in the white paper “roadmap to a single European transport area—towards a competitive and resource efficient transport system” (EU 2011) in which rail played a strategic part. This is valid both for urban and rural areas, since fostering the rail system implies the reinforce of networks, able to connect even isolated areas, as explained before. Propensity to travel by rail depends not only on the transport efficiency, but also on the rail services offered and on the access to them (Brons et al. 2009). Rail services and a high level of accessibility could be related even with the use of bicycle, providing secure parking, flexible rental especially for daily or long trips use (Givoni and Rietveld 2014) or an easy transport of bicycle on the train. Combined use between bike and train represents a valid alternative to car and should be promoted by specific urban and territorially policies. Good results of these strategies, in terms of sustainable transport habits, are already acting in northern countries of Europe, such as Holland (Martens 2006), Germany, Denmark or Switzerland. In addition to these aspects about rail services provided by stations, recent mobility’s paradigms suggest that time spent in inactivity (such as waiting at stations) is as important as the time spent in motion (Bissell 2009). Therefore, time spent waiting train or shifting from transport means to other represents an occasion to provide services able to reactivate both internal and external spaces of the stations. In this way, rail stations have come to be seen as places within urban and social environment. On the contrary, at present, not only in Italy, stations, especially if small and medium sized, are regarded as points of transit and nothing more, that are no places (Alexander and Hamilton 2015). According to this standpoint, the paper first illustrates the actual condition of the railway heritage in Italy, managed by RFI Spa, Rete Ferroviaria Italiana. It was deeply analyzed critical condition of small and medium sized stations: they are active but they are becoming empty containers (RFI 2002), because it is not necessary the presence of any railway personnel, generating degradation both in train service and urban context. Even if they represent most part1 of the Italian railway heritage, they are not exploit in their potentiality for what concern the infrastructural, intermodal, territorial, urban and social aspects. It is described also the classifying method used by RFI to define its stations. This aspect could be really interesting since classification of railway stations is a powerful tool for strategic transport and land use planning, considering station in terms of node -the connectedness with other places- and urban place-possible activities around the station (Reusser et al. 2007). Existing classification relies strongly on the indicator ‘‘passenger frequency’’, which focuses on transport related issues, blending performance with preconditions at a given site. On the contrary, classifications based on the relevant demands and conditions given by context could lead to clearly interpretable classes and supports multi-perspective strategic planning for railway stations. This kind of systematic approach allows for a better understanding of the interrelations between railway stations and their context (Zemp et al. 2010a, b). Despite the current ideas on the regeneration of stations, it is explained how and why cycle tourism can innovate such strategies, considering its peculiarity and potentiality in promoting territorial plan (Pileri 2015). This new kind of synergy, was applied designing a cooperation between cycle tourist backbone VENTO, the project of the longest cycle tourist path in Italy, along the Po river, and small and medium stations in its proximity. It was considered how bicycle and train could be strategic assets to exploit, fostering also positive effects on the urban environment and on the territory. 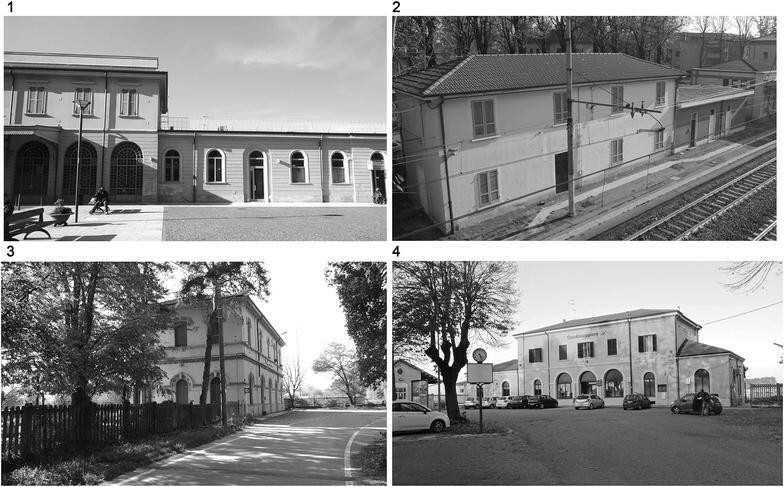 Understanding the actual condition of railway heritage in Italy was the first step to elaborate a regeneration strategy. Active railway lines are formed by more than 16,000 km (http://www.rfi.it 2017). Just a minimal part of them, 6%, consists of high speed lines, connecting 11 biggest Italian cities.2 On the opposite, most of them, are conventional lines divided in fundamentally lines, above 6000 km, complementary lines, above 9000 km and nodes lines, that are located around metropolitan areas, above 950 km. As emerged by these data, complementary lines, that are characterized by traffic lower than fundamentally ones, are the most relevant in terms of length and diffusion in the Country, being the network to connect medium and small sized towns and villages. The importance of this heritage is not only based on the speed of the service, connecting just a minimum part of the Country, but on the capillarity of this infrastructure, able to make in contact even inland areas. Moreover, active stations in Italy are more than 2500 divided in four categories (RFI 2001). It is possible to count 13 platinum stations, located in the biggest cities connected by high speed lines, 103 gold stations, related also with big cities but not connected by high speed lines, 850 silver and 1500 bronze stations, that are medium and small stations. It is necessary to highlight the critical condition of silver and bronze stations since most part of their spaces are unused or under-used. Indeed, the spaces useful to manage the railway traffic are not even necessary cause these specific functions were moved and concentrated in the biggest stations. This technological improvement, started in Seventies, has caused increasing degradation of stations, without any railway personnel, where also tickets are sold by internet or an automatic machine. This state of abandon is enlarged to the other rail spaces and buildings surroundings, such as the square in front of stations and other service spaces anymore used. Even if small and medium stations are experiencing this state, generating also a sense of discomfort and unsafe in the travelers, there is not any specific strategy to regenerate this heritage in an organic way. Until now, the unique action promoted by RFI Spa is related with the possibility to give for free custody of empty spaces of the stations to Municipalities or to no-profit organizations (RFI 2014). This agreement lasts 5 years, and in this period who has obtained the spaces has to take care of them and can use them for social or cultural aims. Functions proposed are not able to foster any strategy to regenerate the whole station building, since they aim just to exploit empty spaces. Actually RFI Spa manages 1700 stations without any railway personnel, where some spaces could be given for free. It is possible to count 350 stations where spaces are already reused in different ways, thanks to these kind of agreement. Finally, regarding with the classification of stations, it was defined in 2001 by the official RFI document Carta dei servizi”, where stations are considered crossing points between demand and offer of rail services. According to this view, stations are classified in platinum, gold, silver or bronze (mentioned above) on the base of four criteria: rail system dimension, daily number of travelers or users—that is the “passenger frequency”—intermodal attitude with other transports modes and commercial offer. Moreover, classifying in different categories implies also a different management run by different companies. Grandi Stazioni Spa promotes the development of platinum stations; Centostazioni Spa has to increase and organize commercial spaces in the gold stations. RFI Spa has the role to manage silver and bronze stations. In other words, just a little number of Italian stations, 5% of total heritage, is managed by holdings dedicated to their development. The most part of the railway heritage has no specifically plan to exploit its potentiality. Starting from this actual condition, it was designed a strategy trying to make stations triggers of an urban, territorial and mobility reactivation. In order to reach this goal, it was exploited the innovation power of the cycle tourism, a touristic mobility riding on long and secure paths. Cycle tourism paths are formed by a great cycling network that covers the territory of one or more regions. It needs some main routes, which should be straight and long-distance, around 100–150 km, continuous, possibly paved, and exclusively reserved for bicycles and pedestrians. Given that the long distance routes exceed local ones, and that their use is mainly for tourism, they are defined as cycle tourist backbones. The scheme is simple: their purpose is to establish the structures that can hold together the local and global, and to be recognizable. This kind of extra urban mobility is well known in north European countries, such as Holland, Germany or Austria, where thousands of bikers crowd the paths (AA. VV. 2009, 2012; ADFC 2017). One part of the success of these tourist cycle paths is due to the infrastructure which enables even cycling inexpert to pluck up the courage and decide to take a ride. Cycle tourism is not, and should be not be thought as a sporting experience just for someone who is physically prepared, but rather something cultural and enjoyable for everyone. This tourism experience has to be easily accessible since it embeds a cultural project: passing slowly and continuously between different landscapes allows them to become narrative and representative places in movement. This is the reason why it is able to generate a number of important effects, activating an economy spread all over the territory crossed, producing jobs and economic benefits (AA. VV. 2014), and reactivate an unusual way of visiting places, where it is important not just the departure and arrival point, but the path is even more relevant. Basically, tourist cycle paths promote a “light mobility”, having zero environmental impact, and generating multiple positive effects. Considering its peculiarity, cycle tourism can become a new opportunity to regenerate small and medium stations from different points of view. First, cycle tourism can promote an original cooperation between cycle mobility and train. Bicycle and train are complementary: train lets to cover long distance in few time, and bicycle is more flexible and lets to explore inland areas. Such strategy able to generate a synergy between these two mobility means, implies the development of a sustainable mobility involving both daily urban transfers and long trips to discover the territory around. Secondary, cycle tourism could be a resource able to attract people in inland areas, usually forgotten by the most relevant flows of tourism. In this way even the flow of passengers using the secondary rail lines and their small and medium sized stations can increase. Third, according to the nature of cycle tourism that brings people to enter into a territory, just riding, stations return to be a gateway to a specific area, that is possible to discover thanks to the slow journey’s philosophy. Fourth, cycle tourism and its users bring an innovative power to activate different kind of functions, complementary to the transport role of the stations. This aspect is particularly important for small stations where filling empty spaces with commercial and retail functions, a strategy usually used in the biggest stations, is not useful and attractive since there is not the huge amount of users of the metropolitan areas. On the contrary, these stations can be reactivated thanks to other functions, related with the bicycle culture, but also hybridized with arts, culture and creative fields (Kana 2012), becoming an innovative hub to regenerate inland territories: cooperation with cycle tourism offers an original opportunity of redemption to the local areas. Regeneration of small and medium stations thanks to the interaction with the cycle tourism was experimented in a specific case study. Indeed, starting factors of the project presented are the cycle tourist path, VENTO, and some small stations located in its proximity (Fig. 1). VENTO is the project, promoted by a research group of Politecnico of Milan, of a 679 km cycle tourist path mainly along the Po River, from VENice to TOurin, via Milan (http://www.progetto.vento.polimi.it 2017). According with the general features described above, this cycle tourist backbone will become the means to regenerate the territory, with multiple repercussion on the areas in the Po valley (mostly classified as inland area). On those who live in that territory who are in search of new interpretation after the economic crisis, as well as on tourists who are drawn to the imagery that VENTO will foster through cycling, the beauty of the landscape and the exploration of new, unexpectedly beautiful places. Therefore, VENTO project intends to propose a kind of pedagogical cycling tourism through which we can both teach and learn some lessons about local places, traditions, people and environment (Pileri et al. 2015). VENTO is first and foremost a project about the local area and landscape, able to generate a territorial project, and secondly a project on cycling (even if the infrastructure is relevant and has to respect the features of a backbone, such as long distance, safety, etc.). Keeping the local area as the main focus also means welcoming another scale to the project, one that bypasses administrative boundaries and territorial jurisdictions. The type of cycle tourism proposed by VENTO is based on four key characteristics: (1) a power to revive citizens and landscape of inland zones, not just cities; (2) valuing the concept of transit: being between places, in contrast to the almost exclusive idea of travel as only being about the origin and the destination; (3) inclusivity, or rather being accessible to all; and, finally, (4) the distribution of benefits generated across a wide territory as opposed to the concentration of benefits in the hand of few. It is evident that these aspects will influence also the regeneration of stations, involving cultural, territorial and social spheres. There were analyzed all stations in a buffer of 15 km. Considering not only stations directly along the path VENTO, but also stations quite distance from it, implies the development of secondary cycle paths connecting stations with VENTO. This system contributes to generate a cycling network formed by the main infrastructure, the backbone VENTO able to attract thousands of cycle tourists3 (ADFC 2017), and by local paths, possible deviations from the main direction. This network represents an opportunity to regenerate inland areas on a large scale view, since positive effects related with such mobility and tourism habit, in terms of visitors and economic benefits, hit the territory nearby the cycle backbone: each user can decide which territory exploring and where and how starting and finishing his journey or shifting from bicycle to others transport means. As mentioned before, RFI has already elaborated a strategy to reuse empty spaces in stations. Nevertheless, such strategy presents some critical points. (1) The first is related with the lack of a systemic an organic vision: each stations, even if is connected to others by a rail network, is considered an isolated building. This vision generates multiples actions and projects not able to communicate and interact each other. (2) Another one consists of the methodology used by RFI for the management of the legacy of these small stations. Indeed, proposed strategy aims simply at filling empty spaces of stations with some functions, not considering the redesign of the entire building and without any regenerative view, able to enlarge the vision to a territorial scale. These are main issues emerged in the RFI strategy. Starting from this critique there were defined some guide lines for the regeneration process proposed in this study. Former aspect concerns with the fragmentation problem caused by the lack of a general idea about the reuse of this heritage. Also in this case, cycle tourism model provides a support to solve the isolation and fragmentation of these stations and of their reuse’s experiences. Indeed, cycle tourism, by its nature, seeks to unite and create a network so that it can became a new narrative thread capable of collecting landscapes, places, cultures. At the same way, thanks to cycle tourism, stations’ regeneration finds a fil rouge, something in common that allows to create a network of similar project, recognizable but at the same time with specific peculiarities. Not only for what concern some specific services provided to cycle tourists, but rather for the same regenerative vision promoted by the innovative synergy between cycle tourism and railways system. Criteria to re-design small and medium stations become common elements able to generate a strategy where stations in inland areas are regarded as trigger for a cultural, social and territorial relaunch. Moreover, considering latter critical aspect, the strategy defined in this project was based on the certainly that such regenerative process needs to involve the whole station building, rethinking all its spaces, not just those ones empty and available. From this standpoint, it is fundamental rethinking also external areas, imagining a project where rail services still useful in these kind of stations can be associated with new functions. Then, in addition to these elements, there are other points making up the strategy proposed by the projects of regeneration designed. One consists of multiply the possibilities of small stations, making them innovative hubs, where fostering territorial discovery, slow tourism through inland areas, urban e social regeneration. This reactivation is obtained imagining new and appropriate functions, suggested by the occasion of cycle tourism’s flows. It is proposed to provide cycling tourists with specific facilities, that are a safe storage for bags and bikes, a repair service for bike and a relax area to have a rest and find info about the town and territory around. In addition to these, it is necessary providing also local people with activities, able to reactivate the stations, for what concern the social field: projects have to involve both local and territorial scale, both daily and touristic (sporadic) attendance. Thanks to these new functions, hosted in internal and external spaces, stations shift from places empty, with no more identity, “no places”, to place, urban and territorial gates. Indeed, fundamental aspect of the strategy proposed is that reusing stations becomes an occasion for a territorial and urban regeneration, since they can be again gate to access to towns and landscapes. Therefore, these projects will present some similar aspects: functions and solutions are strictly related with the context, even if are inspired by similar intentions; there is a mix of function playing together; more functions means more kind of users, not only cycle tourists but also local community and commutes; projects want to generate an expectation to discover territory around and its culture; they play with the unexpected and enormous scale to surprise and attract visitors and local community itself; also external spaces are redesigned as urban areas and actively involved in the project, rethinking the station in its whole functionality; it is proposed a flexible strategy with the use of temporality for the design of external spaces. These criteria were applied to stations, considering local features of each one. Facing with a territorial dimension, it is necessary to decline common strategy in a specific context, elaborating different projects animated by a common aim. Assuming cycle tourist backbone VENTO, it was analyzed railways in proximity, in a buffer of above 15 km. In order to elaborate a pilot strategy, it was selected an area included between Parma, Piacenza, Milano and Alessandria (Fig. 2). At this scale, it was carried out an analysis about the features of the rail lines and stations, of the urban context where stations are located and of the crossed territory. First, for what concern rail heritage present, there are 312 km of railway lines, divided in 147 km of fundamental lines and 165 km of complementary lines (Fig. 3). It is possible counting 46 stations (Fig. 4) along these lines: 6 gold, 13 silver and 27 bronze. Just from these few data, it appears clear how the most part of the heritage considered belongs to secondary railway lines in relation with inland areas. Regional office of RFI Spa, managing these assets and involved during this study, would be offer empty spaces for free of 12 stations, 5 silver and 7 bronze. Focusing on these 12 stations (Fig. 5) it was conducted a study in order to identify their urban contexts. It emerges that Municipalities hosting these stations are mostly small and medium towns: six are regarded as small Municipalities (that have less than 5000 inhabitants), four have from 5000 to 15,000 inhabitants, two have more from 15,000 to 30,000 inhabitants. Then, arriving at an urban scale, it was also considered how the building of station and its external areas are organized since these aspects will be taken in count during the project. All the stations are located in the Po valley, in the South part of Lombardy region and East of Piedmont region. The territory considered is cut through by some important tributaries of Po, such as Adda and Ticino. This generates a unique landscape, with water reach plain. Indeed, along these rivers there are natural safeguarded systems, being included in Rete Natura 2000 or in regional parks. Tortona, quite distance from VENTO path (about 15 km), but in a strategical position to access to VENTO: on a railway line connecting Milano and Genova and located in a city crossed by the highway. Territory around is hilly, characterized by four valleys and really interesting for the tracking paths towards Ligurian sea. The big urban square in front of the stations represents a potentiality and also the stations have huge empty spaces to exploit. Codogno, 6.5 km far from VENTO path, represents an important rail node where two different lines meet: one, north–south, connecting Milano to Piacenza and another, east–west, connecting Pavia with Cremona. The context is plainly and reach of traditional farms and livestocks. In this case it is really interesting that an entire building, the old place for rail police, besides station, is empty and available. Pizzighettone, just 3.5 km far from VENTO path, is located in a beautiful historical village, crossed by Adda River, one of the main tributary of Po and it is possible to navigate it. Territory is reach of natural resources since there is a regional park and the little station itself is included in this park. This is its main peculiarity: the bronze station is located in a very quiet place, in the nature and directly connected with the path crossing the park, one of the possible secondary path in relation with the backbone VENTO. Casalmaggiore, in a little town along the Po River crossed by VENTO. Territory is influenced by the presence of the most important Italian river, with its monumental banks. Also urban context is relevant for the historical square, hearth of the village. Station presents huge external spaces in front and an unused building besides. These stations appear different and were approached with four different projects. Nevertheless, they have some common elements, useful to take in count. All these stations (Fig. 7), silver or bronze, are in small cities or villages, connected with other small urban realities, quite far from big cities and Rail High Speed line and highway. In this context, regarded as peripheral, stations are becoming dirty, empty and unsafe containers where urban external spaces are usually unused or use just as unorganized parking place for travelers that daily leave there their cars without living that urban space (Fig. 8). There is another recurrent element in all these stations: waiting rooms are empty, symbol of how travelers perceive station as “no place”, to cross quickly just to take their train. At the same time, all these stations are not anymore able to communicate to a tourist, cycle tourist in our hypothesis, the richness of the landscape around. They lost their role of urban and territorial gate. 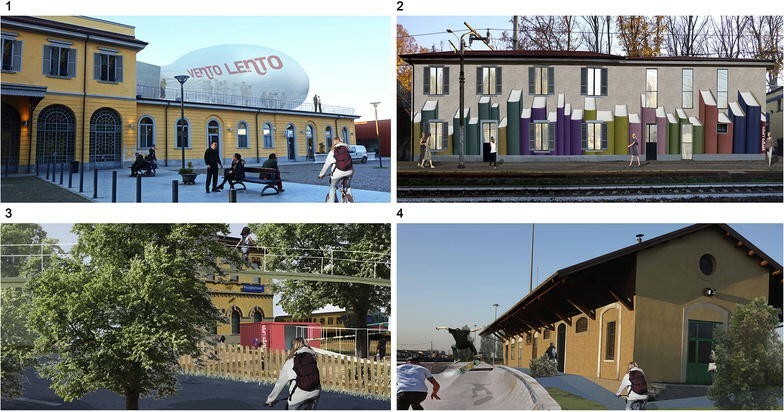 Giving the above, four different ideas were proposed with specific concept for each station: in the station of Tortona is tasting, in Codogno is reading, in Pizzighettone is plying and in Casalmaggiore is jumping (Fig. 9). These projects propose an action evocating specific urban or territorial feature, related with some functions: a little restaurant, a book café, a playground for kids and a skatepark. These are associated and mixed with services for cycle tourists. In order to better explain the design approach, it will describe the regeneration project of the station of Tortona. Case study of Tortona station is relevant first for what concern the mix of functions. Into the station there will be functions for cycle tourists, such as safe storages for bags and bicycle, a cycle repair shop and an info point with relax area where finding all information about the places to visit and take a little rest. These facilities are mixed with the function that really characterizes the regeneration of Tortona station: a restaurant where it possible to taste typical products of surrounding territory and also learn to cook them in a lab area, designed ad hoc. Here, waiting for train becomes an occasion of tasting: both tourists and local people can discover or rediscover what these place can offer and its culinary and cultural traditions. These functions are studied in order to reorganize the entire layout of the station. At the ground floor are located functions for cycle tourists, described above, where it is necessary to easily arrive by bike, without any stairs. Whole first floor is dedicated to the cooking lab and restaurant and it is also present the info point and relax area (Figs. 10, 11). The idea is to give a comfortable space to spend time, just reading some info about the place or having a lunch with typical foods (strawberry, peaches, mushrooms, etc.). Moreover, at the first floor there are two big terraces, actually completely unused, where the internal functions are enlarged. On the left side, where the internal spaces are dedicated to the cook lab, terrace becomes a garden with seats and scented essences useful to prepare delicious dishes. On the right side, where there is the restaurant area, terrace hosts a huge bubble where people can eat. This element wants to be an “out of scale”, something able to catch attention on something new that is happening in the station. External area (Fig. 12), the square in front of the station, is reorganized moving on the right side the car parking, and designing left part as bicycle and pedestrian area. Parking elements for bike are designed in order to generate an urban space, with an integrated seat or little table. Finally, there are two containers, imagined as temporary elements to support some functions, such as rental bike, useful just in some periods. They contribute to design urban space and to animate it. The hearth of the strategy defined in this study lies in giving a new interpretation of the role and value of small and medium sized stations, starting from their relation on one hand with urban context and territory around and on the other hand with a new way to explore territories such as cycle tourism. In this way, stations become places where train commutes, citizens and cycle tourists are put in contact thanks hybrid activities. Moreover, these two kind of mobility, cycle tourism and train, contribute to their mutual development. Cycle tourism, with its capacity to make tourists discovering also inland areas of the Country, could represent the key strategy to regenerate the huge rail heritage in state of abandon. Then, regeneration small and medium sized station changes radically if we consider cycle tourism: from simple reuse of empty spaces by associations or Municipalities with reactivations not connected each other, to rethinking of the role of station itself, as urban space and landmark, as territorial gate, as intermodal node able to promote a sustainable transfer habit and as attractor for local community. Designing a strategy of regeneration related with a linear infrastructure, such as the cycle tourism backbone, embeds the potentiality to regenerate a network of stations, connected and not isolated, but characterized by their peculiarity and their specific project. Combining rail heritage and cycle tourism can generate several positive effects, by working on critical aspects affecting inland areas, such as accessibility level and social reanimation, on the regeneration of urban context where stations are located and on territorial discovering by cycle tourists and local people. According to that, it could be useful to enlarge such strategy at a national scale. Considering the EuroVelo4 (EU 2009; http://www.eurovelo.org 2017) paths crossing Italy (EV 5, EV 6 and EV 8, corresponding with VENTO), there were analyzed railway lines in a buffer of 15 km (Fig. 13). It emerged that the cycle paths planned by EuroVelo system in the Country, above 5300 km, are related with above 4380 km of active railway lines and with 404 stations. As in the case of the railway line in proximity with VENTO path, even on a national scale most part of this railway heritage is formed by small and medium sized stations, mainly located in small Municipalities (Fig. 14). This final analysis aims at demonstrating the huge potentiality for the entire Country of a strategy developing a synergy between “secondary” railway heritage and cycle tourism paths, involving an urban, social and territorial regeneration. According to data available on the official website of RFI, smallest stations represent more than 90% of the total amount of Italian stations. Cities are Milano, Torino, Genova, Venezia, Verona, Bologna, Firenze, Roma, Napoli, Bari and Palermo. Comparing with the existing European cycle tourist backbones. For example, according to ADFC bicyle travel analysis 2017, 682,000 cyclists travelled on the Danube cycle route in Austria in 2016 (with an increase of 6.4% compared to the previous year). EuroVelo, the European cycle route network, is a project managed by the European Cyclists’ Federation (ECF) in cooperation with national and regional partners, that incorporates existing and planned national and regional cycle routes into a single European network. It currently consists of well over 45,000 km of bike paths and thousands of kilometers more are planned—when completed it will total over 70,000 km. RM carried out the study presented and wrote the article. PP supervised the research, with relevant contributes to conception and design of the project and the article, revising it critically for the content. AG has contributed to the research for the technical design of the projects presented and for the supervision of graphic layouts . All authors read and approved the final manuscript. Claudio Ricotti, Rete Ferroviaria Italiana S.p.A., Direzione Territoriale Produzione Milano, Italy. Livia Balzano, Rete Ferroviaria Italiana S.p.A., Direzione Territoriale Produzione Milano, Italy.